Apple co-founder Steve Jobs publicly responded to an article that claimed he and other executives knew about the iPhone 4 antenna issues before the device was released, calling the piece "total bulls---." Apple had already publicly denied the Bloomberg report on Thursday, but at Friday's iPhone 4 press conference, Jobs offered more candid remarks on the subject. Jobs made the comments as part of a question-and-answer session following Friday's press conference, which included Chief Operating Officer Tim Cook and Senior Vice President of Macintosh Hardware Engineering Bob Mansfield. "It's a total crock," Jobs reportedly said about the story. "We talked to everyone about it. We have a great community of scientists. They debate everything. And it's healthy. The best ideas win." Bloomberg had claimed, in a story filed on Thursday, that Jobs and other Apple executives were warned that the design of the iPhone 4 could lead to reception problems. The report also alleged that a carrier partner of Apple's had expressed concern about the iPhone 4 external antenna before the device launched in late June. Jobs also referred to an article from The New York Times issued later Thursday, which said the antenna issues were partially software related, and could be fixed in a forthcoming update to the iOS mobile operating system. "They're just making things up," Jobs said of the Times article. Jobs said the external antenna allows more space inside the phone for features like a larger battery, all while being smaller than the previous iPhone 3GS. The company has no plans to modify its design of the iPhone 4. Apple said all companies produce cell phones with weak spots. Making a phone without one is impossible, they said. There is a Sept. 30 limit for requesting a new case because the company wants to be able to reevaluate the promotion after some time. There is a shortage of cases because Apple couldn't tell its partners the dimensions of the iPhone 4 before it was announced. Apple will not change its approach in the future, because revealing a new product too far ahead of time will kill the sales of the existing model. Jobs, Cook and Mansfield all held out their phones and revealed that none of them use protective cases on their iPhone 4. It's human nature to want to find a successful organization and bring them down, Jobs said. "I see it happening with Google, people trying to tear them down. And I don't understand it... what would you prefer? That we were a Korean company, that we were here in America leading the world with these products... maybe it's just that people want to get eyeballs on their sites." Jobs said Apple loves its customers so much, any option was considered, including a recall. But the number of users experiencing the issue and contacting AppleCare about it was so small, that they decided it wasn't worth it. Customers' biggest complaint about the iPhone 4: They can't buy one, because it's sold out. Some users who have called to complain about iPhone reception have received a visit from Apple employees trying to discover the problems. "They've sent teams all over the country, visiting these people in their homes," Jobs said. These people literally get a knock at the door from Apple engineers with a bunch of equipment and want to plug it in and test reception. We're really serious about this." Jobs said his health is "fine." He noted that he was doing better earlier this week, when he was on vacation in Hawaii. I was kind of shocked to hear Steve use that sort of language in a press conference. It suggests to me that he's really annoyed. It's human nature to want to find a successful organization and "tear it down," Jobs said. He said cited Google as a "great company" that is "jumping on us now." Looks like a big reporting error somewhere, unless there were two separate conversations. Engadget's report: Steve: "Maybe it's human nature -- when you're doing well, people want to tear you down. I see it happening with Google, people trying to tear them down. And I don't understand it... what would you prefer? That we were a korean company, that we were here in America leading the world with these products... maybe it's just that people want to get eyeballs on their sites." So is Steve talking about people tearing down a great company, Google, or about Google tearing Apple down? It seems to be more in line with what Engadget reported. If so, and you're covering the same discussion here, you might want to revise the article. "It's a total crock," Jobs reportedly said about the story. "They're just making things up," Jobs said of the Times article. I hope that this puts to rest any ideas of the New York Times having any journalistic integrity whatsoever. Anybody who believes the New York Times believes fiction that is just made up. Ha! I thought it was only the Fox "News" drones and other such informationally challenged types that spouted this. Hilarious. Still, good to see some direct responses to the hysteria out there. I completely believe that there are people out there with this issue, but based on what I see around here at least, I have trouble believing that it is as widespread as the media theatrics would suggest. That was a little silly. I'm one of many who had some issues, but knew better than to waste my time on hold. And maybe 99 percent tried calling but the phone dropped while they were on hold. The most loyal lieutenants and disciples didn't join Steve on the stage. I know, it's holidays, I know fanbois can tell us lot more stories sounding exactly like this one after weeks of research. ... or that he's not kidding. This is how all of the so-called analysts make their money. Let's run a story that sounds good and will get lots of clicks to our site. You mean the New York Times MAKES the news it doesn't REPORT the news ...? Well I for one am shocked beyond words. I guess the engineers just decided on their own to eliminate Field Test Mode from iOS 4, without telling top management. Steve Jobs is full of crap. OF COURSE HE KNEW AND WAS WARNED IN ADVANCED. He brags on stage that Apple owned and bought a $100 million dollar antenna testing facility during iphone design. Consumer reports used a $10,000 testing facility and found the problem immediately. Steve says they did thousands of tests, and it was only on a small percentage, and that they should have said something during the keynote. OF COURSE THEY KNEW IN ADVANCE, and damn right that engineer told him? You can't tell people you had a $100million dollar testing facility but expect them to believe you were so incompetent that you NEVER ONCE EVER SAW THIS ANTENNA ISSUE in advance, because IF THAT IS THE TRUTH?Then Apple doesn't belong in the cellphone business. And anyway steve jobs refuted that when he said, we knew in advance that all smart phones do this?obviously it was discussed quite a bit BEFORE the launch and they were hoping consumers wouldn't figure it out? As quoted by Jason Snell, the 0.55% figure of AppleCare calls with an "antenna issue" applies to "all iPhone customers", not just iPhone 4 customers. The figure also omits AppleCare calls about reception or anything near. I like it...shows he's human like the rest of us. How many of those scientists to too scared to tell Steve anything other than what he wants to hear? Worst case from this is that if iPhone problems persist, Steve...and Apple could loose credibility with consumers. You forgot your tinfoil hat. Btw, its time for your meds. So you and Jason Snell are both wrong? 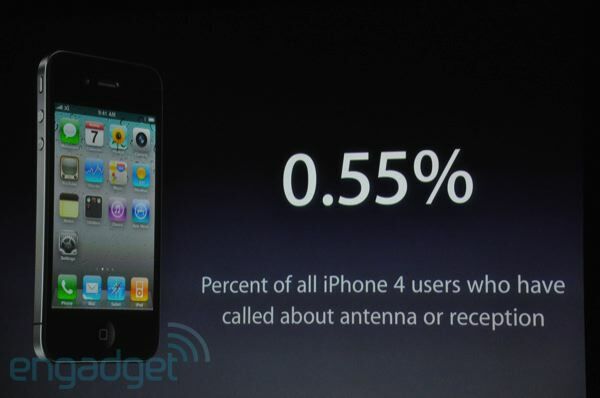 At the press conference there was a giant screen that said "0.55% Percent of all iPhone 4 users who have called about antenna or reception"
they were hoping consumers wouldn't figure it out? Eliminating Field Test Mode from iOS 4 was part of the strategy. Yeah, keep on watching MSNBC... they definitely only report the facts. They never mislead or misrepresent a story.... never! I'd imagine you've never actually watched FOX News, you're just spouting the liberal rhetoric that wants to paint FOX as the bad guy. Next thing you know, you'll be telling me that NBC Nightly News doesn't push a 'green agenda' to boost sales of 'green' products made by their parent company, GE. And, don't respond with the whole NPR crap, cause they're pretty left leaning too. Every news company is leaning. Look, the media as a whole (including FOX, CNN, Etc) have stopped reporting fact. They are in the sales business, not the reporting business. In fifty years, history will look back on the media in this century and find countless events either created or missed.